When you think of the next 12 months, do you think of projects you want to start or changes you’d like to make? If your answer is yes, keep reading. getAbstract had the opportunity to chat with professional development gurus Jason and Jodi Womack. They explain how to get unstuck, Get Momentum and take that first step to success. getAbstract: We all have many goals we want to achieve. How do you prioritize? 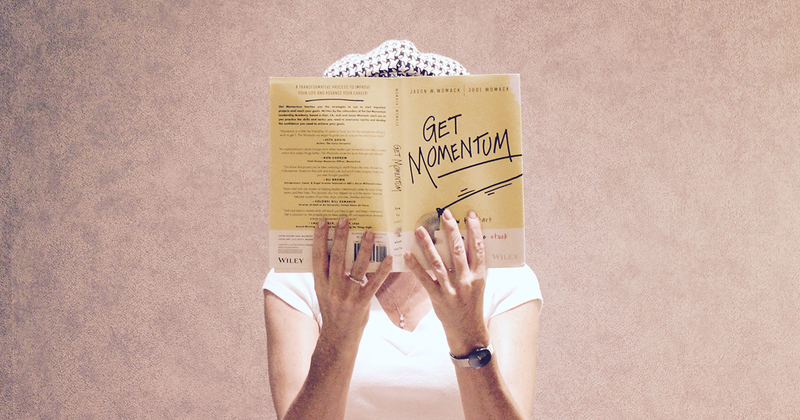 Our book, Get Momentum, helps people make consistent progress on their big, ambitious goals by focusing their effort productively. In reality, you can only have ONE priority at a time. The most important thing is what you’re choosing to do right now. getAbstract: Is there a secret recipe to achieve your goals? Clarify your “Why?” Author Simon Sinek wrote about how powerful a clear purpose is to everyday prioritization and goal achievement. Schedule a meeting with your team at work or home to play at the “higher level” for a while. When you’re clear on WHY you are doing what you do, you’ll feel a deeper sense of commitment to get to work. Stay on the focus line…longer. The “new” time management that we teach in seminars breaks from the old tradition of making lists and time blocking. Now, your productivity is directly proportional to your ability to work for longer periods of time, without distraction. Start with just 15 minutes. Ask your colleagues not to interrupt you and don’t check your email (gasp!). Apply The 30/30 Rule to your work. We teach this tool in our book, Get Momentum. First, open your calendar and look out at least 30 days. Next, choose one thing to focus on and set a timer for 30 minutes. Spend that time thinking, planning, and working on that upcoming event. Do The 30/30 Rule twice a week and within a month you’ll be ahead instead of just catching up! getAbstract: A lot of people get stuck when striving for an important goal. What’s the first step to getting unstuck? (2) ask for specific help from someone you trust. Give yourself the gift of your own attention. Choose a specific project to start, and then invite someone who will help you to meet you for coffee. You’ll get a lot more done, in a lot less time than you thought! getAbstract: After you achieve one goal, how can you make sure to maintain that momentum to achieve other goals? To keep the momentum, take a moment to celebrate the completion. Reflect on the effort you spent to complete that big project. And acknowledge the people who helped you make it all possible. It’s the perfect time to set yourself up to Get Momentum on your goals. Are you ready to achieve your goals in 2017? Participate in the getAbstract Challenge 2017, enjoy our #30DaysOfSummaries and win a one-on-one coaching session with Jason Womack.